Hundreds of stories about the Dalton brothers have been written about their train robberies to their death at Coffeyville, Kansas in 1892. This story tells about the other Dalton brother who died with honor; Deputy Marshal Frank Dalton. 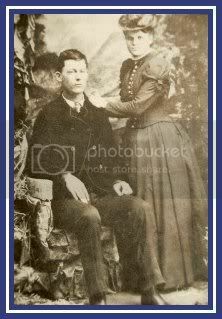 He was born in 1859, the fifth son of nine born to Lewis and Abeline Dalton. Frank never received higher than a third or fourth grade education, but this was due to the financial situation of the family. At the age of nine, Frank began working in stables to bring in money for the family. At an older age, he began working his parent's land, but he also had to work other jobs around the countryside. No matter what it was, he always turned all his earnings over to his mother to make the money go as far as possible. It seemed that he was getting little help from his other three brothers...Grat, Bob, and twelve year old Emmett. Abeline tired to persuade Grat and Bob to assist Frank more, but the rambunctious, rough boys were getting to be too much for her to handle. It was then at the age of twenty-four, Frank along with Grat enlisted in the Cherokee Light Horsemen, (Indian Police) Even though they had very little education, the two Dalton brothers served the Cherokee Nation with courage and honesty. The became a credit the Horsemen, proving to be good lawmen. 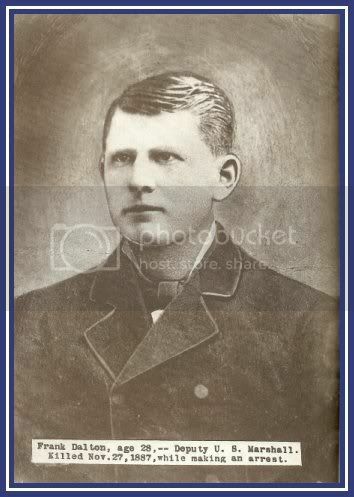 Sometime in 1884, Frank was commissioned as a Deputy U.S. Marshal out of Judge Isaac Parker's Federal Court at Fort Smith, Arkansas. Each Deputy Marshal was not permitted to work alone in the Indian Territory, they were allowed to hire a posse man, whose function was a general helper, and to guard the prisoners transported in the "Tumbleweed Wagon" Frank chose Grat as his man. Across the Indian Territory, Frank and Grat pushed their tumbleweed wagon serving their numerous "John Doe" warrants. By November 27, 1887, Grat had become a Deputy U.S. Marshal in his own right, and had left Frank's side. It was also on that date that Frank fell under a curse of the Indian Territory. Between 1872 and 1896 many of the deputy marshal lost their lives in the line of duty in this violence territory. Frank would be one of them. 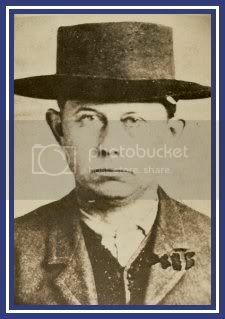 Under the very shadow of Judge Parker's court, in the Arkansas River bottom opposite Fort Smith, there operated a small but fierce gang of bootleggers and horse thieves led by a man named Bill Smith. There were two other gang members, a man named Bill Towerly, and a mean senior partner called Dixon. Judge Parker was considerably embarrassed about the activities of the bunch so close to his courthouse that he ordered Frank, along with Deputy Marshal J.R. Cole to break up their operations, and deposit them in the court's jail. Frank and Cole had just returned from the territory with their wagon and six prisoners late that evening, and decided to make camp for the night and cross the Arkansas in the morning. Rising early, Frank and Cole crossed on the river ferry and was soon at the outlaws camp. Smith, Towerly and Dixon had just sat down in a tent to eat their morning breakfast. The Marshals dismounted their horses and took their positions. With Cole covering the rear of the tent, Frank approached the front. Just outside the opening, Frank ordered Smith out. Smith confronted by the sight of the U.S. Marshal, drew his gun and fired, hitting Frank in the chest. Seeing Frank fall, Deputy Cole shot Smith who fell forward into the tent dead. Towerly then rushed out and shot Cole. The Marshal, having been shot, tripped over the tent rope and fell. Quickly he sprang to his feet, took refuge behind a tree, and started shooting with his Winchester. During the exchange of gunfire, Dixon was shot and fell mortally wounded. Suffering badly from his gunshot wound Deputy Cole decided to depart on foot, under the impression that Frank was dead. He stumbled into Fort Smith where a posse of Marshals were sent to investigate. Little did Cole know that Frank was still alive when he retreated from the camp. Shortly after he left, Towerly came out of the tent and approaching the helpless officer, shooting him twice in the head with a Winchester, while Frank was begging him not to do so, as he was already dying. When the posse reached the scene they found Frank, Smith and Dixon dead and Towerly escaping by horseback. Frank's body was brought back to Fort Smith, and after being embalmed at the undertaking establishment of Bernie Brothers, was placed in a coffin, and sent to Coffeyville, Kansas by rail for burial. Franks Dalton's funeral was held at the Elmwood Cemetery south of town. It was attended by many U.S. Marshals who had known and worked with him out of Fort Smith. Also attending was his three brothers, Grat, Bob and Emmett. At the time of Frank's death, Grat was a commissioned Deputy U.S. Marshal out of Fort Smith, Bob was one out of Wichita, and Emmett was a posse man for his brothers. All three wearing a star. One would have thought they would have dedicated themselves to service of the law in honor of their martyred brother, but four years later Grat and Bob were laying in their own graves located 25 yards from Frank's, dying without honor. 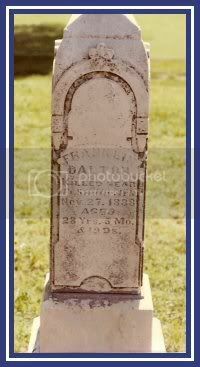 Frank Dalton died at the age of twenty-eight. He was a fearless and efficient officer, and an honest, upright young man. He was highly esteemed by all who knew him for his many good qualities. He was definitely was the best of Dalton boys.